As I've been listening to the raging debate here in the U.S. over what to do about our soaring national debt, out-of-control government spending, and tax policy, I can't help thinking about marriage. No, Really. More on that in a minute. This debt/spending crisis is a train wreck waiting to happen. Everyone knows it, but few are in agreement about what should be done to avoid it. Meanwhile, the train just keeps barreling down the track, picking up speed.But I digress. This contentious discussion is infused with words like “fairness,” “equity,” and “entitlement.” I’ll be honest and tell you that these are words that tend to grate on my nerves. Typically when these words are invoked, what they really mean is that someone, somewhere, “owes” something to someone else. Implicit in these statements is the notion that an elite set of individuals gets to decide on what fair and equitable means, who owes what to whom, ultimately determining which things certain groups are entitled to take from other groups. The problem I have with most of the debate is that so many assume a poverty mentality. What I mean by that is that they assume going in that things like wealth, success and resources are in limited supply and capped by the present reality. To those who think this way it’s a zero sum game. So, rather than looking at how to get another pie, or maybe a whole pie factory, the only way to be fair is to say that everyone is entitled to the exactly the same size piece out of the pie that exists today. The reason I’ve wandered into this controversial social, political and economic territory today is that there are strong parallels to the way many see their marriages. Those who look at their marriage as a zero sum game tend not to concern themselves with how to grow themselves or grow their marriage. Instead, they look at what is and try to figure out how to divide it up fairly. Equality and fairness have too often become the criteria by which marriage success is measured. As I’ve said before (see my post The Myth of Equality) that’s just the wrong yardstick for marriage. 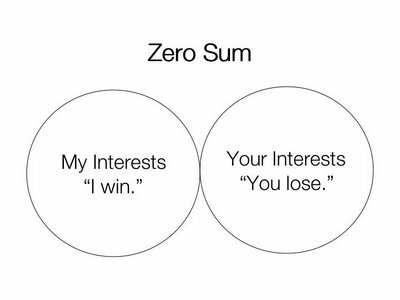 The zero sum mentality is what lands so many at the 50/50 marriage paradigm, which says that everything should be divided right down the middle. Husband and wife are to work, cook, clean, manage finances and raise children exactly by halves, as if running parallel lives that minimally intersect, if at all. To them, fairness can only mean sameness. They would have you measure your spouse’s 50 percent carefully and often, fight for your rights and for what you are owed, and make sure that you get back in a measure equal to whatever you give, (and if you can get a little more than that, so much the better). But is this the way of a biblical marriage? If our model for marriage is Jesus and the church, then the 50-50 marriage model really doesn’t apply. Jesus gave 100 percent. He gave his own life in order to have us 100 percent. He gave all to us and wants us to give all to him. He showed us the way of perfect love: all in, one hundred percent, nothing held back. What would your marriage be like if both of you threw out the scorecards? What if you were both one hundred percent in, putting everything you have and everything you are into your marriage? What if instead of equity and fairness as the measure of the quality of your marriage, you used the love of Jesus? There is one other important biblical concept that greatly influences the mathematics of marriage: being one flesh. When a man and woman are joined together before God and man in holy matrimony, the Bible says they become “one flesh.” They are to see themselves as one in every dimension: sexual, spiritual, emotional, financial – every dimension. Now let me remind you that being one does NOT mean being the same! That's 50-50 thinking. Being one actually means adding strength to strength and allowing strength to cover for weakness. It means coming together in a way that makes your marriage more than either of you as individuals. You don’t lose your individuality. Rather, you bring your full, genuine self to your relationship for the benefit of your spouse and your marriage. Here’s the deal with taking a one-flesh view of your marriage: whatever accrues to your spouse also accrues to you. If my spouse wins, then I win too. If I grow, our marriage grows. When he or she is blessed, then so am I, even if I am the one doing the blessing. Marriage is not a zero sum game. 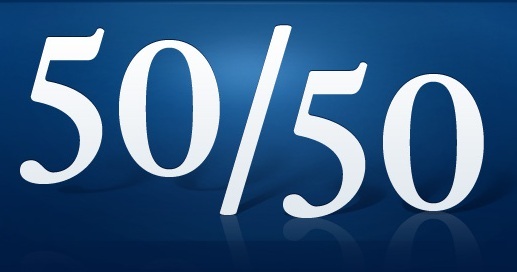 Don’t settle for a 50-50 marriage – go for 100-100! Since writing the draft of this post, I came across Sheila Gregoire’s terrific article on her To Love Honor and Vacuum blog , entitled “The 99% and the 1% With Marriage.” The article runs in a similar vein, comparing current socio-political events to marriage. Great reading! Thanks for making such an important point. Maybe with a roommate you could share chores and rent 50/50, but marriage is a different endeavor. I agree with you completely, Lori. Quoting from the movie Date Night, the goal of marriage is not to become "excellent roommates." This is a great post thank you! If we would continue to use Christ and the church as our example, things would get cleared up much quicker in our marriages.